Secretary of State Jon Husted outlines his Ohio Prosperity Plan during a visit to the Lima Pallet Company Monday afternoon. Husted is running as the Republican candidate for lieutenant governor alongside Mike DeWine. LIMA — Suspending state regulations. Training workforce. Changing intellectual property laws. Those are just some of the tools suggested by Secretary of State and Republican lieutenant-governor candidate Jon Husted as a handful of suggested changes comprising a new economic policy plan rolled out by Mike DeWine’s governor’s campaign. Known as the Ohio Prosperity Plan, DeWine and Husted have been touring Ohio this past week to roll out the plan. Husted, who is running as the Republican pick for lieutenant governor, visited Lima Monday. Before running as Ohio’s Democratic candidate for governor, Cordray acted as director of the Consumer Financial Protection Bureau under President Barack Obama’s administration. Ohio’s General Assembly would need to sign off those powers to the governor’s office before DeWine could decide what regulations to cut. Other policy changes Husted presented to local Republicans during his Monday visit to Lima Pallet Company included pushing employers to work closely with educators to better equip students with in-demand certifications, providing government-funded training to the “incumbent” workforce, aligning state tax law to include newly-defined “Opportunity Zones,” allowing university researchers to own their intellectual property to spur innovation and expanding broadband infrastructure. https://www.limaohio.com/wp-content/uploads/sites/54/2018/08/web1_HustedPlan.jpgSecretary of State Jon Husted outlines his Ohio Prosperity Plan during a visit to the Lima Pallet Company Monday afternoon. 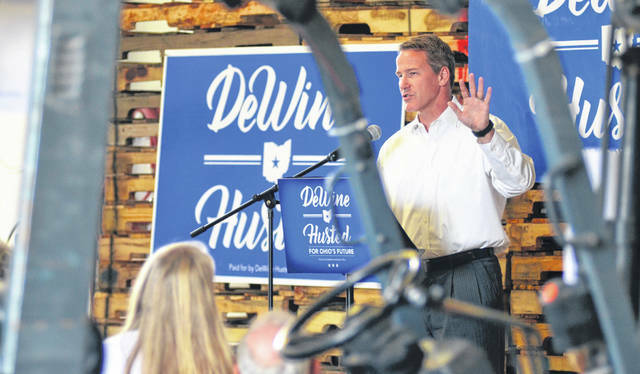 Husted is running as the Republican candidate for lieutenant governor alongside Mike DeWine.